Fuel Up to Play 60 is an in-school nutrition and physical activity program created by the National Dairy Council and the National Football League, in cooperation with USDA, that helps today’s youth lead healthier lives. Fuel Up to Play 60 encourages students to work with adults to implement school-wide healthy eating and physical activity “plays” — initiatives that help students “fuel up” with nutrient-rich foods like lowfat and fat-free dairy foods, fruits, vegetables and whole grains and “get up and play” for at least 60 minutes every day. For example, a Fuel Up to Play 60 team might collaborate with their school nutrition director to create a Grab n’ Go breakfast station to encourage eating a nutritious breakfast. The Fuel Up to Play 60 Playbook, grants, exciting rewards and additional resources help make the customizable program easy for any school to implement and any student to be engaged. Fuel Up to Play 60 has helped to make wellness part of the game plan in more than 73,000 schools across the county, including more than 3,600 schools in Ohio and West Virginia thanks to the states’ dairy farmers. Millions of students nationwide are more active and are eating healthier because of Fuel Up to Play 60 and the support of its more than 100,000 adult volunteers. 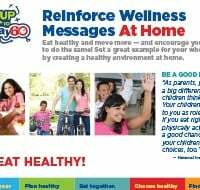 Join online at the Fuel Up to Play 60 website and get tools, resources and step-by-step guides to bring the program to your school. Work together with students, teachers, staff and adult volunteers to plan and implement Healthy Eating and Physical Activity Plays. Boost your efforts with funding opportunities and community support. 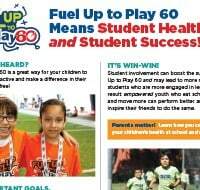 Have fun and share your success with the Fuel Up to Play 60 community and the American Dairy Association Mideast. Get rewarded with recognition, prizes from the NFL and the positive impact you made in your school! What Does Christian Kirksey Fuel Up For?